Alyssa Englert here from the Hartford Hawks Women’s Basketball Team with a quick update from France. WOW, has it been a couple of busy but fun filled days here in Paris! Yesterday while on our tour of Paris, we got to visit and explore the Eiffel Tower, the Notre Dame Cathedral, and then go on an amazing boat ride around Paris and see the city illuminated at night!! This place is absolutely beautiful and breathtaking!!! Today they took us to The Louvre museum so we could see paintings and sculptures like the “Venus de Milo,” The Winged Victory of Samothrace, and best of all…the Mona Lisa! Never thought I would be able to see that up close, what a great experience! 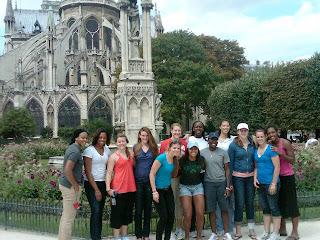 After the museum, we explored Montmartre and did a little bit of shopping. We are back at our hotel for a little while and then out for our final dinner in Paris! It’s been such a great time here with the team, coaches and athletic staff! Certainly going to be hard to leave here tomorrow but we are off to Rodez, France to play some basketball!!! GO HAWKS!! !